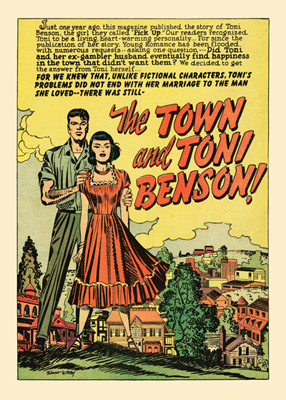 In the late 1940s, Joe Simon and Jack Kirby — creators of Captain America — set the comics world on fire with the creation of a new genre that resulted in some of the best-selling American comic books of all time: the romance comics. The stories they created were exciting, innovative, and beautifully drawn, and remain a high point in both artists’ careers, even as Kirby went on to become the unrivaled King of Comics and co-creator (along with Stan Lee) of many of the most iconic characters in American history. These two towering titans of the field produced stories for titles such as Young Romance, Young Love, and Western Love for over twelve years until the genre ran out of steam in 1959, and Jack Kirby moved on to a little-known outfit called Marvel Comics. 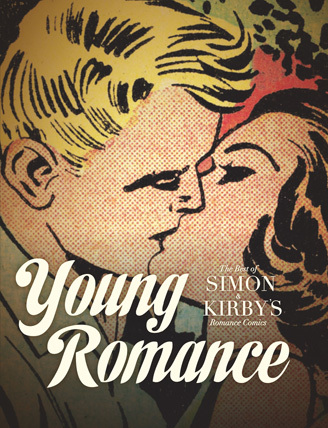 Young Romance: The Best of Simon & Kirby's 1940s-'50s Romance Comics brings this wonderful work back to light by reprinting 21 stories in full-color, from 13 years of Simon and Kirby’s romance comics: 208 pages of never-before reprinted material compiled and restored over a five-year period by artist and animator Michel Gagné. I’ve been an avid fan of Jack Kirby since I discovered his work at the age of seven. Kirby took me to the stars, introduced me to powerful beings and ignited my young imagination. 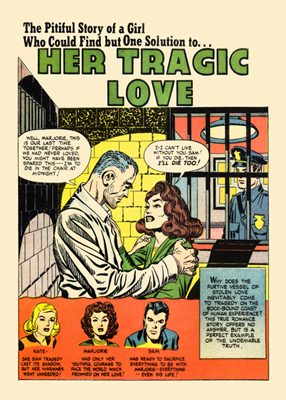 A few years ago, while reading a book on the history of comics, I realized that there was an entire facet of Kirby’s work that I hadn’t even seen: The romance comics. Indeed, Kirby and his partner at the time, Joe Simon, had set the comics world on fire in the late forties with the creation of a new genre that resulted in some of the best selling comics of all time. I became curious and wanted to read some of these stories. I started searching on the internet, at comic stores and book stores, in the hope of finding a book compiling some of this obscure work. To my surprise, there was very little available. The only book I found was the long out of print, Real Love: The Best of the Simon and Kirby Romance Comics by Richard Howell: A volume featuring black and white reprints of thirteen stories, including nine from Simon and Kirby. The featured Simon and Kirby stories were excellent but they only spanned a three year period (1949-1951) while the team’s romance output lasted twelve. Granted, 1949 to 1951 was a creative peak of Simon and Kirby’s romance stories, but my inquisitive mind wanted a general overview of the entire output, not a mere snippet. My search to find sample reprints from the post code era (1954-1959) turned up nothing. That’s when I started looking for the original comics. Certainly not an easy task. 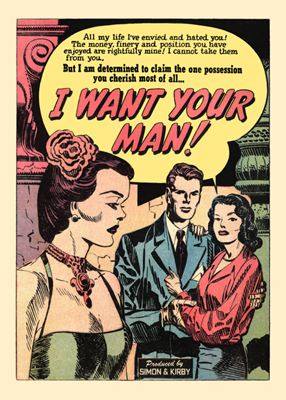 Romance comics were bought by girls and women who, contrary to their male counterpart, did not have a tendency to collect. The comics were read and discarded. Even though the print runs were some of the highest in the history of American comics, very few copies survived and most of the ones that did are in pitiful shape. I quickly realized that if someone didn’t make an effort to preserve this material, most of it would vanish into oblivion. That’s when it hit me! Perhaps I should be the one to start the ball rolling. Comics have given me so many hours of enjoyment throughout my life, maybe it was time for me to give something back to the medium in the form of a preservation project. 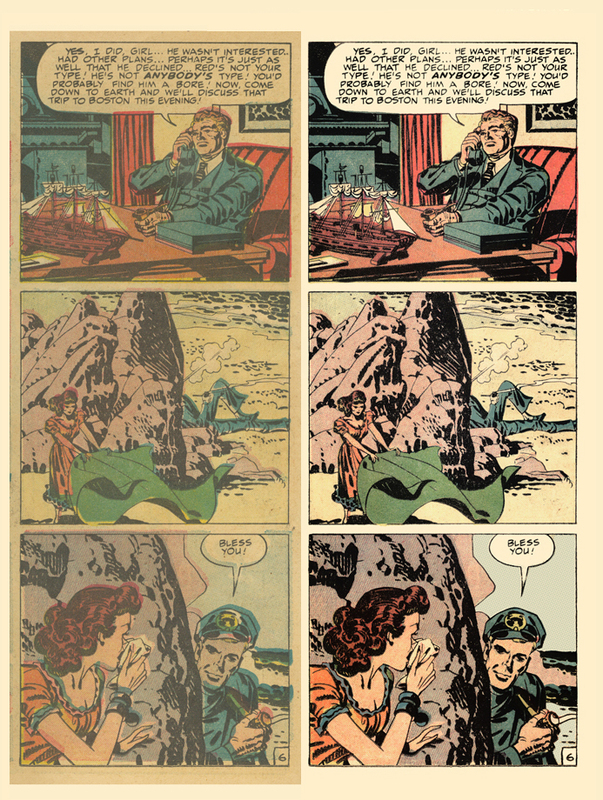 Thus, I made the seemingly easy, yet decidedly crazy decision to restore, compile and edit a book featuring an overview of the entire span (1947-1959) of Simon and Kirby’s romance comics. In my effort to put this volume together, I hunted for the original comics on the internet, at conventions, and reached out to collectors. After two years of treasure hunting, I managed to gather a huge amount of material. To complete the overview, I included two examples of the western sub-genre, a nice selection of covers, and never before reprinted post-code stories including the last romance story Simon and Kirby did as an artistic team. The most time-consuming aspect of putting this book together was the restoration process which was completed over a period of several years. 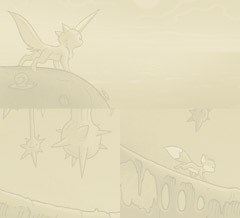 My goal was to make my work as unobtrusive as possible and let the comics shine in the best possible way. After experimenting for about six months using various digital methods, I finally achieved the results I was looking for. 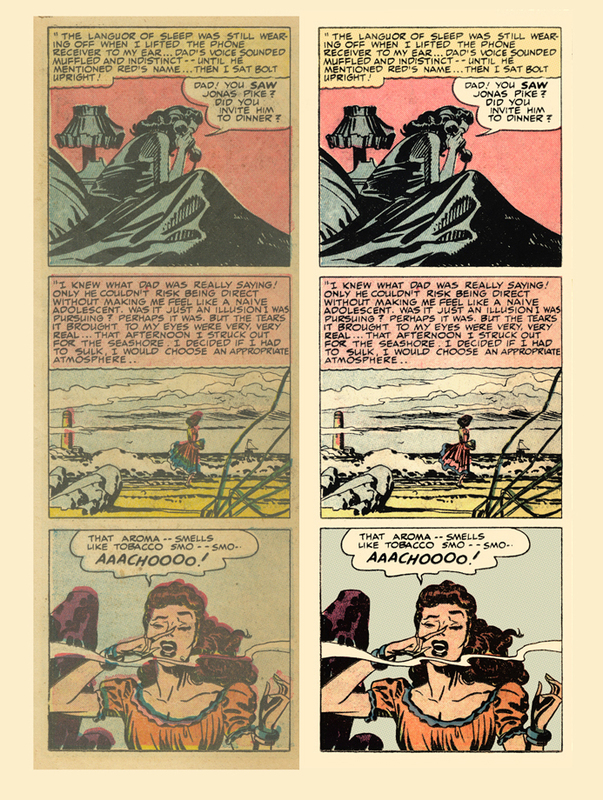 From hi-res Scans, I performed a myriad of delicate tasks: I cleaned the gutters and the text, re-saturated the colors and darkened the black ink, realigned excessive color bleed when I felt it was too distracting to the staging, and repaired or recreated the color dot matrix when it was too messy. Other duties included: removing aging paper artifacts (brown spots), water stains, rips, pencil and crayon markings. Insome cases I had to draw missing letters and drawings.